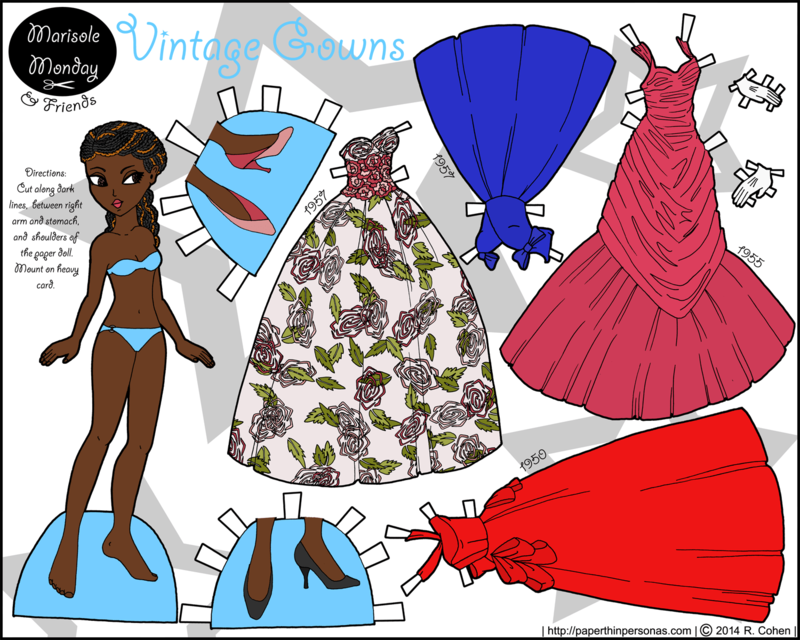 Last week, I posted this paper doll set in black and white for coloring. I promised I would talk a little about each of the gowns and where they came from. I need to learn to streamline my method for dealing with elaborate florals, or I need to never do one ever again. Normally coloring a paper doll set takes about 2 to 4 hours, at most. Sometimes longer, but only if I take a lot of breaks and am doing a lot of other stuff. If I have my colors picked out and I’m on a roll, I can do the set in about an hour when I’m really on the ball, though formatting, saving and other detail work takes longer. That single floral dress took me nearly an hour, by itself, to color. NEVER AGAIN. Let’s talk about where each gown came from. The floral gown, the blue gown and the red gown are all from the V&A in London. The blue gown is based on this red dress from 1957. The red evening dress was drawn from this evening gown by Hardy Amies was made right after fabric rationing was lifted in England (1949), so lacks the layers of lace and silk that were common in evening gowns on this period. I love the simplicity and shape of the dress. The last dress from the V&A is my favorite, the floral evening gown made in Paris and worn by the wife of the British Ambassador. I tried, but I don’t think I captured the beauty of the rose patterned skirt and layered bodice. The last pink dress comes from The Met, known as “Tree” this gown was designed by Charles James. Of all of the gowns I drew, I feel like this one didn’t work. My style of flat color just can’t capture the layering of the gowns beautiful fabric. Liana did a beautiful version of Charles james Butterfly dress on her blog several years ago which I think captures his work better than I did here. Okay, that’s everything. Happy MLK Day to those in the US who are celebrating like me. I love the floral dress. I’m sorry it was so hard to color, but it looks so wonderful. I think it’s my favorite of all the dresses. It’s my favorite too. While I was coloring it, I hated it, but when it was done, I was like… well that was worth it.